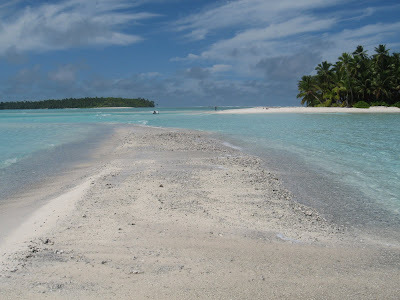 We were planning to depart Salomon Atoll this weekend, but the atoll had one more adventure in store for us. 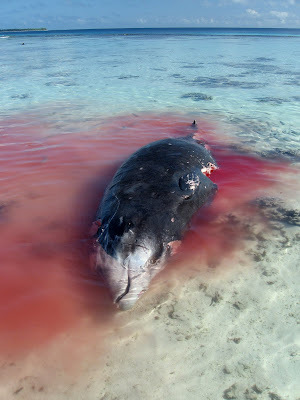 On Friday morning, Toni and Darren on Ovation spotted a whale washed up on the reef between Fouquet and Sepulture. When they told us about it, we took off to try to find it (with a detour back to the boat to grab a camera). We scouted around for a bit in the shallows, surfing the waves coming over the reef on the spring high tide, but couldn't see anything. Meanwhile, Russell and Karin on Moonwalker were making their way back from Boddam. Surfing down a wave back towards the lagoon, we noticed that Moonwalker had come to a halt far from the anchorage. A few minutes later, Ovation's dinghy was speeding across the lagoon. We figured that Moonwalker had found the whale, so we headed out towards Ovation's dinghy. There was the whale, about 15 feet long, floating across the lagoon. The whale had clearly not been dead long. It was in very good shape with no decomposition evident. The eye was still clear. Other than a few cookiecutter shark bites and scrapes from its trip over the reef, the dermis was intact. The whole time, I was thinking about the story that Richard and Kathy on Mr. Curly told us about the beaked whale skeleton that washed up on Anglaise a few years ago and how excited a group of scientists got about it. We decided to try to keep the whale carcass for the BIOT scientists. With Ovation's help, we hooked up a towing bridle and brought it back to a makeshift mooring off of Fouquet. Once we were back on Mata'irea, we checked the books and determined that it was some kind of beaked whale - based on the fact that there are two teeth jutting out of the bottom of its jaw. Then we dropped an email to the Marlin to let them know it was here. We were interested to see if it makes it through the night in one piece. I'd call it a FAD (fish attracting device), but it is more of a SAD (shark attracting device). There certainly won't be any swimming in the anchorage for a while! Later that afternoon, in the middle of a squall, we noticed a sailboat approaching the pass. I hailed them, to welcome them to Chagos and offer them any assistance they might need. The response, in broken English, was "This is the Japanese yacht Yamia. 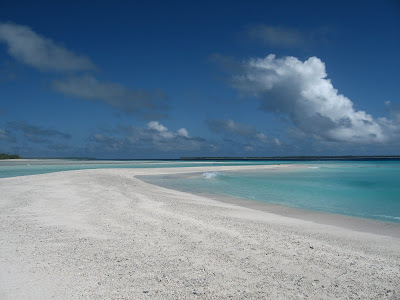 Are you the governor of Chagos?" Thinking that they were kidding, I shot back with "no, but when the Mayor left, he told me that I could be the gardener." Within moments Eileen from Tigger was on the radio with "Who are you kidding girl . . . I'm the gardener!" The poor Japanese crew was so confused. Their confusion must have compounded as jokes flew back and forth about their timely arrival. 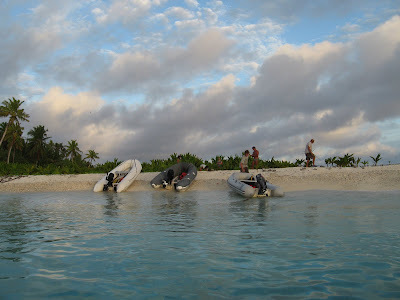 That evening, as this is Chagos and we'll use any excuse for a cocktail party, we held a dinghy raft up/wake to toast the passing of the whale. The crew of the Japanese boat joined us. We all did our best to hold back on the whale steak and sashimi jokes. When woke up Saturday morning we discovered that the whale was gone. Sten assumed that his knot had been bad; but, when Bryan from Aroha found the whale floating in the middle of the atoll, it was revealed that the tail had been chewed away in the night. There was also a big hole in its flank, from which clouds of blood were billowing. Below the whale we could see big (BIG!) sharks circling. It was clear that if we left it in deep water, there wouldn't be anything left for BIOT to examine. So we towed it into the shallows. 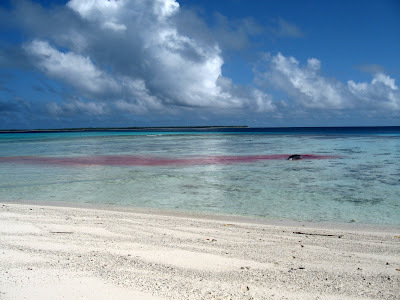 As the whale bled out, a river of red blood snaked its way through the aquamarine water, attracting many interested parties. The first scavengers on the scene were the black tip sharks. Then the filter feeders found it. We also saw red bass, blue fin trevally and giant trevally, It was dead low tide, so bigger predators couldn't reach the whale where it sat among the reef. We were cruising slowly across the sandy shallows, paralleling the slick of blood and oil, when Sten spotted a large, dark shadow swimming towards us through the crystal clear water. As it got closer, the outline of the broad, shovel-like head and distinctive vertical bars became clear. Tiger Shark! The shock of seeing such a predator was momentarily surpassed by fear as the immense animal swam directly under the dinghy, studying us all the while with its large black eye. This beast was easily longer than our dinghy, making it over ten feet long. Sten was the first to find his tongue as he shouted "Get the camera! Get the camera." Within minutes, a second tiger swam by us following the scent of the whale. It was at that point that I declared that I was never going in the water again. Tiger sharks are the most feared tropical shark and one of only a very small handful of sharks that will actually target humans. 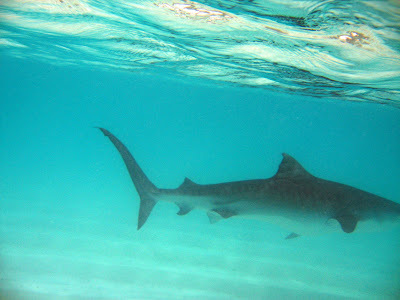 While most shark attacks on humans are grab and drop affairs of mistaken identity, there are many documented cases of people being taken and consumed by these sharks in clear water conditions. They are responsible for more fatalities than any other shark found in the tropics. Despite all the time we've spent snorkeling inside lagoons and outside atolls, we'd never even caught sight of one, until Saturday morning. A nurse shark, cruising the shallows. By midafternoon the nurse sharks, which are fluid and flexible creatures, were thrashing around in the small shorebreak, feasting on the carcass. Several times they were left high and dry on the sand as a particularly large wave receded. We sat in the dinghy, anchored just off the shore in four feet of water, watching the show and taking lots of pictures. As the whale rolled over in the waves, the nurse sharks, with their jaws clamped into its thick blubber, would roll right over with it. It was really something to see. It was like watching The Discovery Channel or a National Geographic special, only it was right in front of us. Meanwhile, the tiger sharks, which are much more comfortable in deep water, would come in to the shallows to see if they could reach the whale. They were just too inflexible or uncomfortable with the shallow water to feed on the whale. In their frustration they would turn away from the whale, and towards the dinghy. Several times a tiger shark cruised us, gliding by slowly as it tried to decide whether we would make a tasty snack. There were a few tense moments when a tiger swam right under the dinghy (was he going to try to flip us?) and then again when one swam right towards the middle of the dinghy, seemingly on a collision course. Our dinghy has a hard bottom, but the pontoons are inflated tubes. Two weeks ago, one of the tubes was pierced by a silvertip shark while Sten was out fishing. He made it back to the boat without a problem and we hauled it out and patched the tube, but we were left with a healthy fear of shark teeth. After a few passes by the tiger shark, we realized that dinghy safari was probably not such a bright idea. That evening during low tide the five boats in the anchorage held a BBQ on the beach near (but upwind from) the high and dry carcass. We visited the whale a few times during the party to see what was happening. The hermit crabs and ghost crabs were all over it, tearing at the flesh. We were surprised that the boobies and terns showed no interest in the carcass. Sunday morning the BIOT patrol boat arrived. The fisheries officer took some measurements and photographs of the whale. He agreed with our initial identification of the whale; it was a Cuvier's Beaked Whale. We all agreed that it was getting a bit whiffy and that it would be best to tow it out on the next tide and let nature take its course, otherwise it would stink up the whole atoll (already boats were leaving in droves; Aroha, Moonwalker, and Yamia all left Sunday afternoon - though their departures probably had something to do with the good weather window). Later that afternoon we met Ovation on the beach to ready the whale for removal. After donning rubber gloves and swiping some Vick's Vapor Rub under his nose, Sten carved a hole in its lower jaw large enough to fish through an old wire running backstay. It was a gruesome job, but Sten and Toni got right in there. Then we waited for the tide to rise. A few hours later, as we were hooking up the towing bridle to the wire, I took a tumble into the water, face first. I came up sputtering, covered with whale oil and blood. I'm sure I smelled like a character straight out of "Two Years Before The Mast." I've never felt so disgusting. But before I could get back to the boat to shower (with lots of hot water and antibacterial soap) we still had to get the whale off the beach. It took all four of us, using two dinghies, both of which were equipped with a 15hp engine, to haul the whale out of the hole it had dug in the sand. Once we got the whale off the beach, we towed it out into one of the 'swimming pools' in the reef and attached it to an anchor. We were all for allowing nature to take its course, but we didn't want to miss the show. The relatively shallow water (approximately 10 feet deep at high tide) and sandy bottom would allow us to see what was happening under the whale. We also decided to make sure that the show started before nightfall, so we made some additional cuts in the carcass keep the blood flowing. Now, I know this sounds horribly cruel, but the whale was dead and already half eaten. Besides, we'd all seen enough wildlife specials to know that this was how it was done. Of course, it is entirely possible that we've been out in the wild for too long. We all headed back to our boats to get cleaned up, assuming that it would take a while for the sharks to find the whale. But by the time I had defunked and Sten had finished the evening radio net, we could already see sharks hitting it. We grabbed both cameras and met Ovation at the whale. We dropped our dinghy anchor a short distance away from the carcass. Ovation rafted their dinghy up to ours. Almost immediately, the large tiger shark that we had seen the day prior, made distinct by a big notch in its dorsal fin and therefore nicknamed "Notchy," cruised the dinghies and headed for the whale. There was no rush and no excitement evident. Notchy's every movement was deliberate and without wasted energy. The shark would slowly circle the whale, find a likely looking spot, nuzzle up and latch on with its widely spaced serrated teeth. There was no wild shaking or tail movements, just a subtle twisting of the body. After a few seconds Notchy would ease its head back into the water, leaving another huge chunk of blubber missing. The scene repeated itself over and over. After a while, Notchy was joined by a second, slightly smaller tiger shark. Several times the two tigers were feeding on the whale simultaneously, with seemingly no concern for the other. At one point it appeared that our short scoped dinghy anchor was dragging; so, Toni eased her dinghy anchor quietly over the side to keep us from getting too close to the action. This brought an immediate response from the various sharks in the vicinity. First we were cruised by the numerous silvertips. Then Notchy came over to investigate. He swam right under both dinghies. We could see his head emerging from under Ovation's dinghy while his tail was still visible on the far side of ours. In profile, a tiger shark is intimidating enough, with its long sickle-like tail and blunt snout; however, only from above does one see the true power inherent in the creature's massively wide head and shoulders. At these times, when the shark was directly under the dinghy, it was clear that this was a creature to be respected. It was also clear that we should leave the tiger sharks to feast in peace. As night fell, we headed back to our boats. How have you been?This is Huiling from the Japanese Yacht Yaima.The whale story in Chagos is soooo vivid from your article.It reminds me the great days and warm friendship there.Danika,I am wondering that if I can use some of your pictures to tell the end of this whale story ?Can I link your story on my blog? I love reading your blog.It seems that I am there ,too. I am happy that I found your great blog on google search.Thank you for your wonderful sharing. Hope to meet you again on the sea!